I had been heating my above ground 24 foot x 4 foot swimming pool in NH with some eight 4x10 roof mounted pool collectors. The roof faced west and had a 20 degree slope. Needless to say early mornings and spring output weren't great. One day I decided to paint the vertical south exterior wall of the pool black. Boy did that help. First the wall was exposed to the April sun much more directly and throughout the day. Second the heat transfer to the pool was great because the sun struck the black metal pool wall directly and the only thing between the heated wall and the water was the very thin 20 mill pool liner. In spring the object is to get the water up from freezing so the pool wall barely runs above ambient air during the day resulting in near zero loss back to the air. In my case I doubt the addition of a glazing would help much although it might be worth it as the pool temp rises to swimming level. Of courses the pool heat losses were the same. In summary the cheap black paint extended the season 3 weeks on either end. 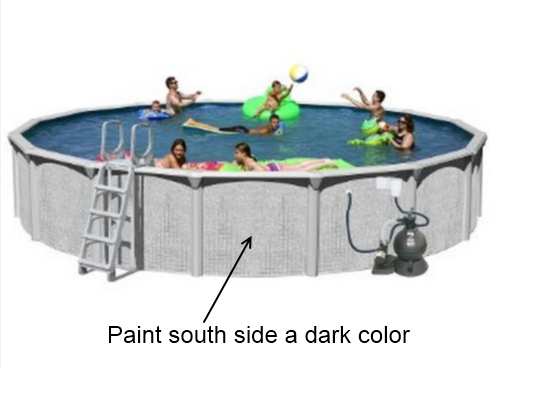 Imagine the effect if all above ground pools came with black exterior walls. Even better if they were selective. Further in summer the south wall of the pool got less sunlight so didn't overheat. I really like this -- its about as efficient a pool heater as you could devise, costs almost nothing, does not take up any space, and an HOA could not possibly object to it! You can enjoy swimming even in winter with this pool. This idea is simple but amazing.